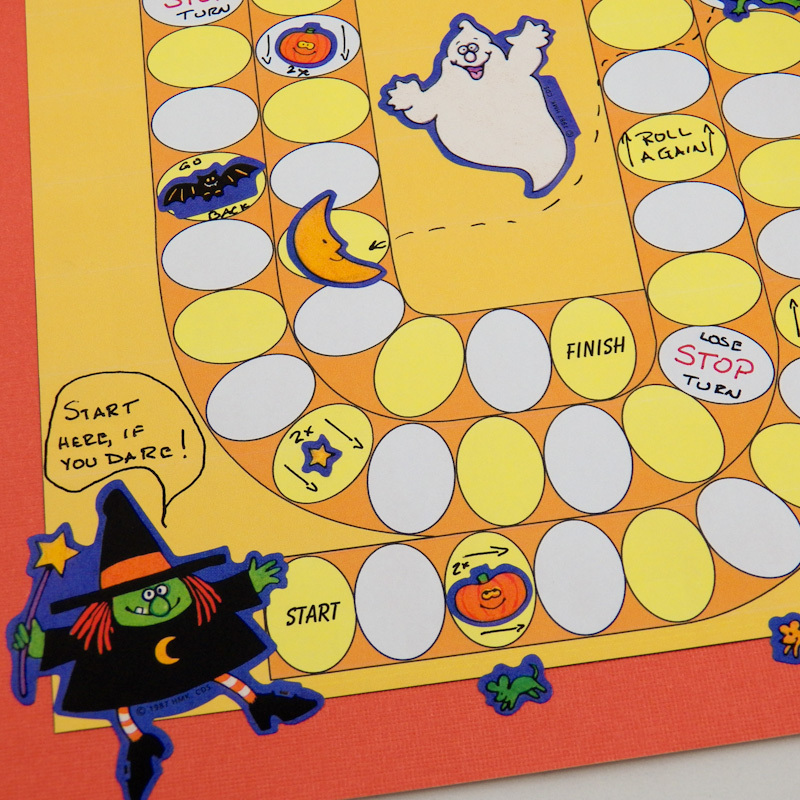 Here's a race game that the whole family can make together and then play! It's great for post-Thanksgiving dinner fun. Just print the game board patterns, then cut and glue. 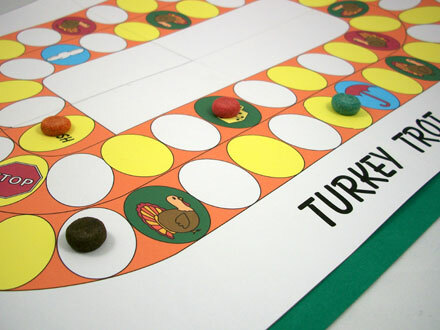 That's all it takes to make the game board for Turkey Trot. Make your own race game! Included in the project are patterns and tips for making a game board for a race game of your own invention! You can make a game for just about any theme, idea or event. A blank game board and set of stickers makes it super easy to make a game. 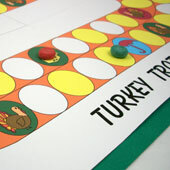 The Turkey Trot game and rules are based on the Game of Goose—a race game with roots dating back centuries. There are many different game boards and rules for the Game of Goose, which is sometimes called the Game of Life. 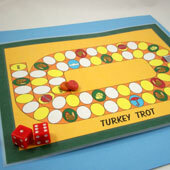 See the rules for playing Turkey Trot at the end of the project. Checkout other Thanksgiving and fall crafts. Choose a game board to make. Download and print the pattern(s). Print the patterns for all four sections of the game board—Upper Left, Upper Right, Lower Left, and Lower Right. Or, print the Small Game Board pattern for a game board that fits on one page. You can print on computer paper or directly on white cardstock. Use the Design Your Own patterns to make a game board for a Goose-like race game of your own invention. Make a game that generally follows the rules of Turkey Trot and features similar game spaces. 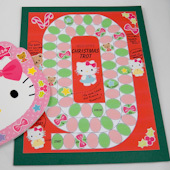 Decorate the game board with drawings or base a game board on a set of stickers (see examples in the sidebar). If you printed black & white patterns, color each game board section with any colors you like. You might color the spaces with alternating colors. Pick two contrasting colors, or leave half the spaces white. Save time by leaving the blank egg spaces white. If your are using a Design Your Own pattern, make light pencil marks where you want each type of game space. In Turkey Trot there are six forward-facing turkeys (go again), two backward-facing turkeys (go back), two dice spaces (roll again), two STOP spaces (lose turn), one jail space (lose two turns) and an umbrella and cloud pair (jump ahead). 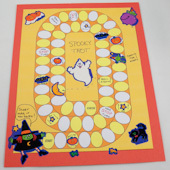 Make drawings with markers on each game space or use rubberstamps. Add writing to explain the rules or make funny comments. Tip: It's fun to make a game board using stickers. You can make a game for a holiday by using a set of stickers for that holiday. Trim the printed patterns to the outline around the section, or within ¼" to ½" of the outline. If you leave a border, make its depth the same on all four game board sections. Be careful to cut the angled sides of the glue tabs precisely. This will help the game board fit together better. If you are using the Small Game Board or the Design Your Own there are no glue tabs and you can skip to Step 5. Once you have cut all four sections, glue or tape them together. To do this, lay out the sections in their correct positions. Slide the glue tab on each section under the adjoining section. Join the first section with the second section. Proceed around the board doing one seam at a time. Be careful to align the game board's track at each seam. Tip: If you printed on computer paper, you can make the game board more durable by gluing it to cardboard—poster board works well. Protect your game board from getting dirty with clear contact paper. 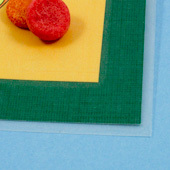 Cut two pieces of clear contact paper about ½" larger than the game board in both dimensions. Apply one piece of contact paper to the back of the board and the other piece to the front. Be sure to center everything and to smooth out any air bubbles. Trim the contact paper, leaving a small border. Contact paper is self-adhesive shelf liner usually available on rolls in hardware and discount stores. Here's what you need: 2 dice and 1 unique playing piece per player. 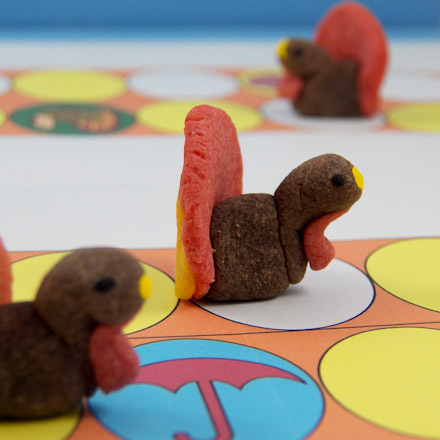 You can use game tokens from other games, or make your own using Aunt Annie's Modeling Dough, see the sidebar for how to make special turkey playing pieces. In a pinch, you can use colorful cereal as game pieces. Object of game: To be the first player to reach the last space, exactly. Other players continue playing for places. Before you start: Throw the dice to determine the order of play. The player with the highest total on the dice goes first, then play proceeds around the board to the left. Players race around the board from start to finish. A piece is moved based on the throw of two dice. If a piece lands on a forward-facing turkey, the piece is moved forward the same count again. If a piece lands on a backward-facing turkey, the piece returns to the space it came from. If a piece lands on the umbrella, it floats up to the space marked with the cloud. If a piece lands on a space marked with dice, the player gets to throw the dice and move again on the same turn. If a piece lands on a stop sign, the player loses his or her next turn. If a piece lands on the jail, the player loses his or her next two turns. That player gets an early release if another player lands on the jail, taking their place. A player's piece must land exactly on the last space to win. If the throw is too high, the piece is moved forward to the last space and then backward with the rest of the count on the dice. 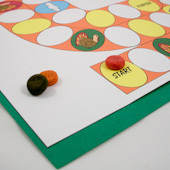 Tip: The small Turkey Trot game board prints to a single sheet of paper or cardstock. It is best for games played by just two players. Tip: Make a more durable game board by gluing the pattern to poster board. Tip: Get creative! 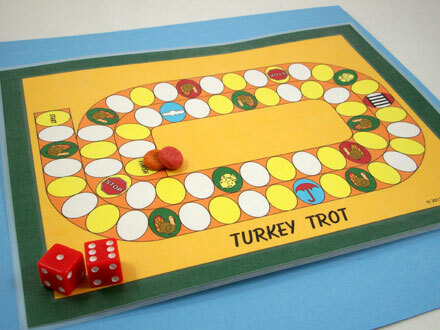 Print one of the Design Your Own game board patterns and create your own Goose-like race game similar to Turkey Trot. 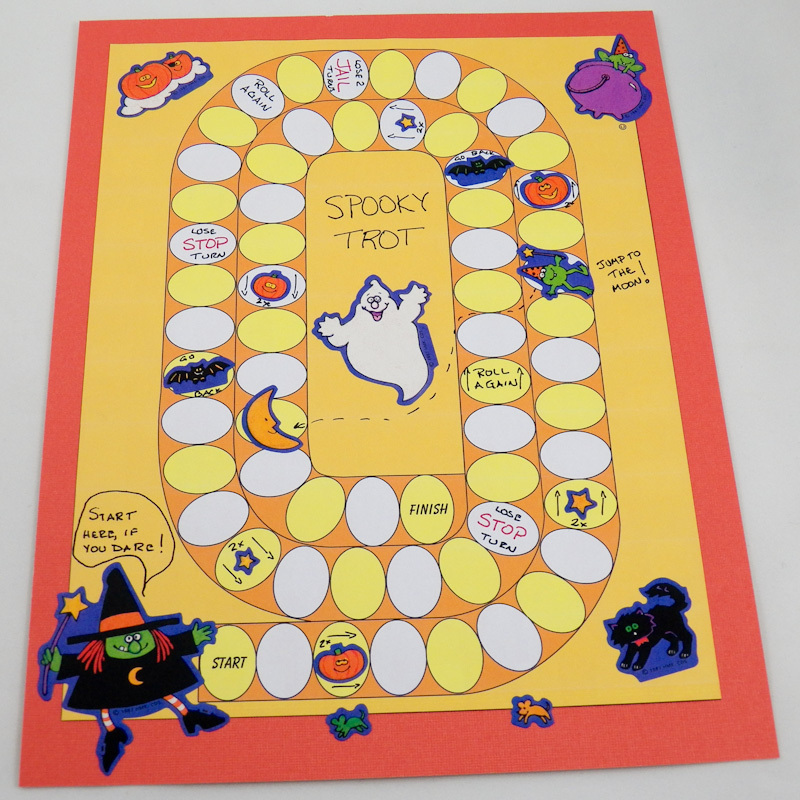 Use Halloween stickers to make a game called Spooky Trot or use stickers for your favorite cartoon character to make a game featuring the character. How about making a game called Hello Kitty Christmas Trot with the red and green Design Your Own game board pattern? Tip: Write things on your game board like game instructions or funny sayings. For extra fun, make playing pieces from Homemade Modeling Dough that are shaped like Miniature Turkeys. Tip: Use a word processor to make a rules card for your game. Print it out and keep it with the game. 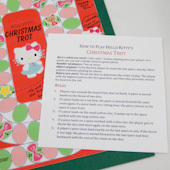 To get you started, here's a Word file with the Turkey Trot rules, and others with the Spooky Trot and Hello Kitty Christmas Trot rules. Tip: Protect your game board by sandwiching it between layers of clear contact paper.